Hear health care experts explain the changes, and what we can do to reclaim the NHS. Speakers: Doctors John Ashton and John Puntis; James Alexander, Labour Leader of York City Council; Coun. Andrew Cooper, Kirklees Green Party ; Dermot Rathbone, Save Our Local NHS Hull and East Yorks. David Byrom, chair of Mid Yorks Hospitals Unison Branch; Jillian Creasy GP, Leader Sheffield Green Party. Bring banners, placards, musical instruments, costumes etc to make an impact, and let us shout up for a publicly owned, comprehensive health service where it’s co-operation not competition that counts, and people not profit call the shots. 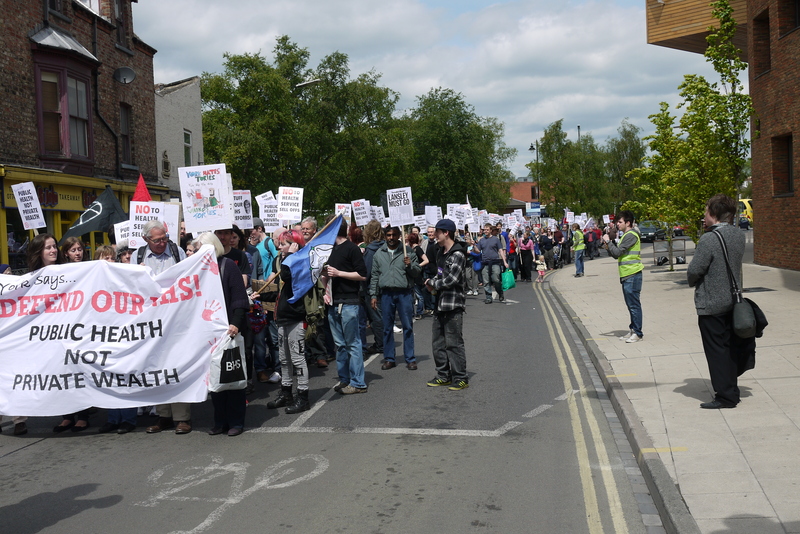 March organised by Defend our NHS/ Keep Our NHS Public groups from York, Leeds, Hull, Bradford, Kirklees, Calderdale and Harrogate.